La Sagra del Vino – no pizza here! 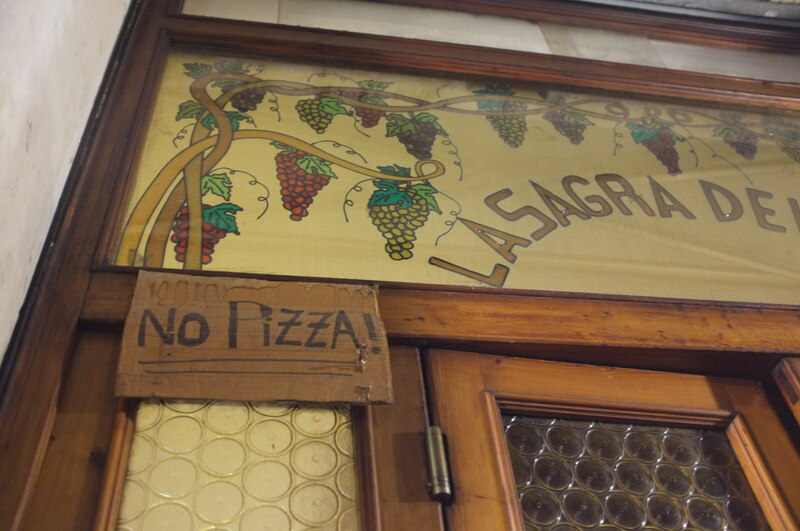 La Sagra del Vino was my first experience of traditional Roman trattoria-style dining. I was taken there by my Roman housemate and connoisseur of Rome’s best eateries. A meal out with him never disappointed. La Sagra del Vino is a family-run restaurant (and in Rome, this really means family-run, not opened by a family and now managed by other). Gran cooks, her daughter takes the orders and her husband circulates the dining room keeping customers cheery. The restaurant first opened in 1938 and is the place to experience true Roman cuisine. Don’t be fooled by the unassuming setting – the drab walls and paper-covered tables are by no means a reflection of the food. Nonna cooks like a pro. 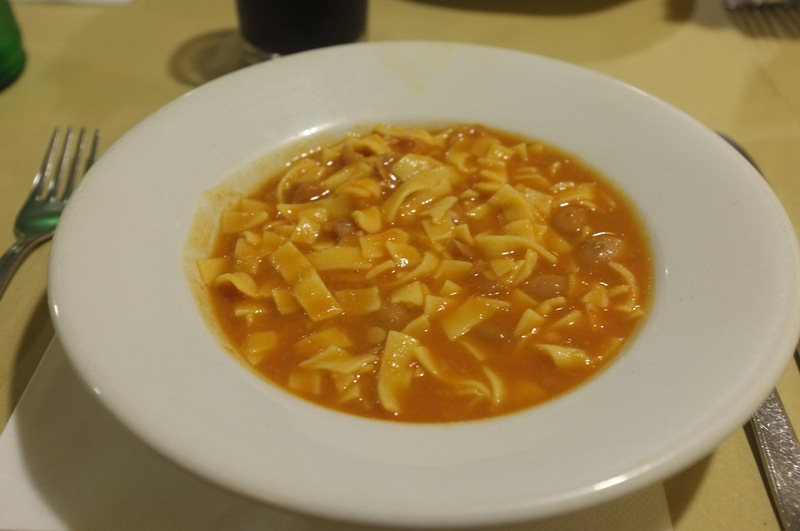 Our multi-course meal commenced with a serving of classic pasta e fagioli soup; a simple but well-flavoured tomato broth with ribbons of pasta and beans in. 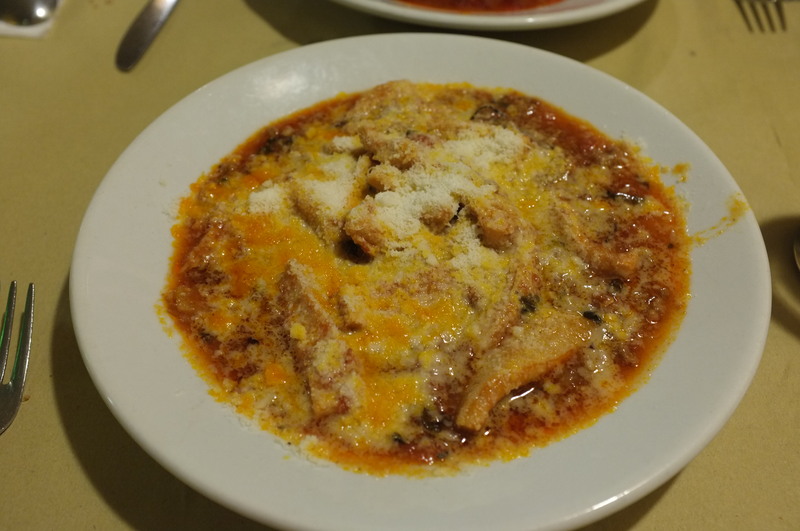 The soup was followed by tortiglioni alls gricia; a typical Roman pasta dish, simply composed of tasty guanciale (pig’s cheek), garlic, olive oil and black pepper, finished with plenty of pecorino cheese. For the secondi, we decided to share a selection of meat and vegetable dishes. The coda alla vaccinara was (excuse the metaphor) to die for! The meat was so tender that it struggled to hold its shape. The veal had been slowly simmered with celery, carrots and onion in a rich tomato and wine sauce and plenty or aromatic herbs, cinnamon, nutmeg and black pepper. 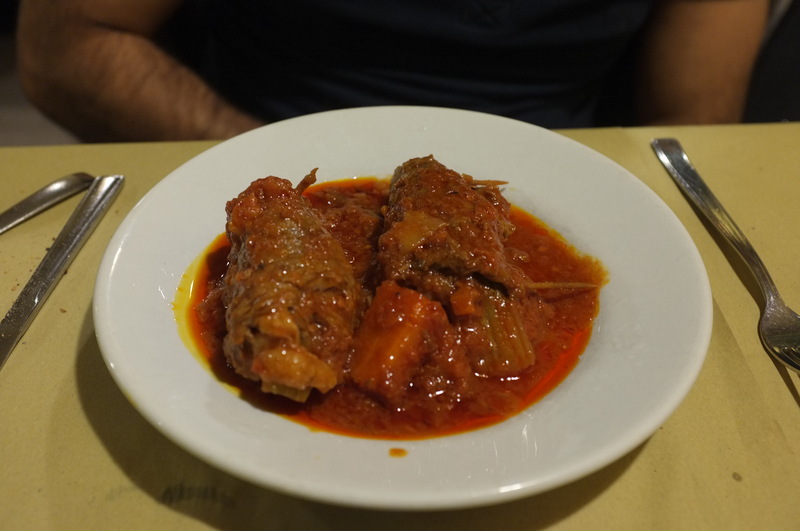 This next dish was something I have never tried before and, to be perfectly honest, had no wish to ever eat – trippa alla Romana, also know as cow’s stomach. Sounds delicious right? Bare with me… Once you have convinced yourself that its only meat and tried to ignore its alien-like appearance, the flavours were quite incredible. The dish had so much flavour in its tomato sauce and, thankfully, the generous coating of grated Parmesan helped to mask the unappealing appearance. 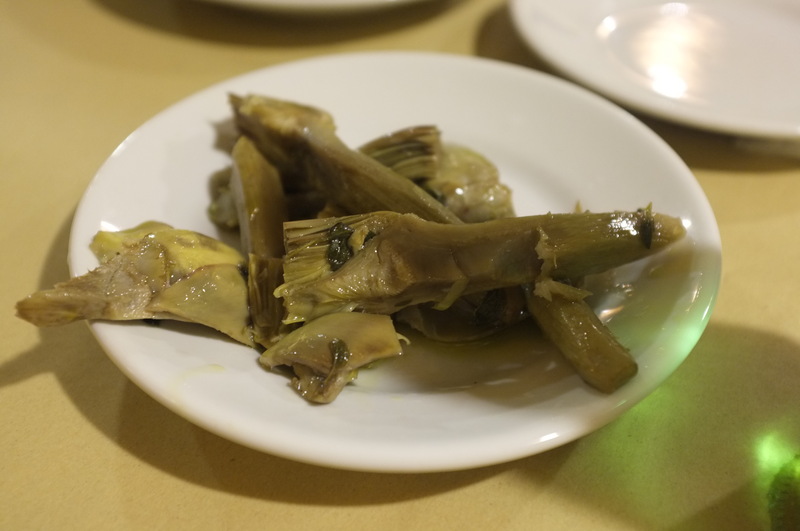 I absolutely love artichoke and the Roman way to prepare them is my favourite. Cooked until tender and tossed in olive oil. 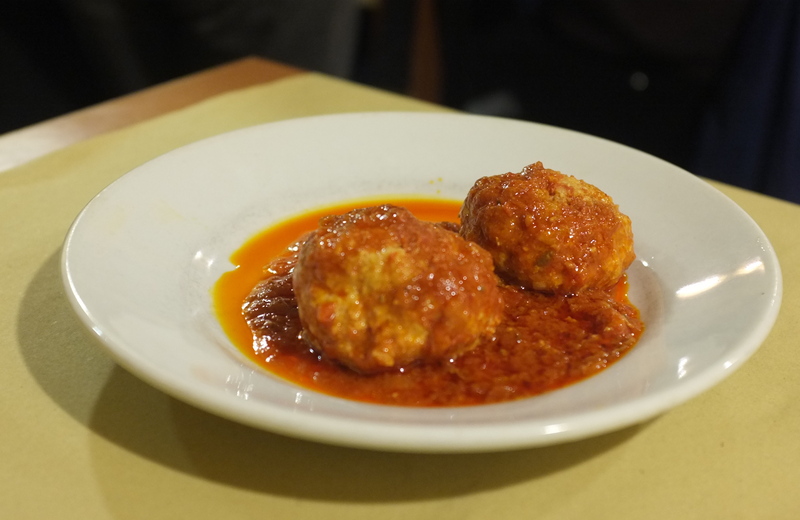 The polpette came in yet another extraordinary tomato sauce. This time, the sauce had a delicate citrus flavour and the meatballs were light and succulent. 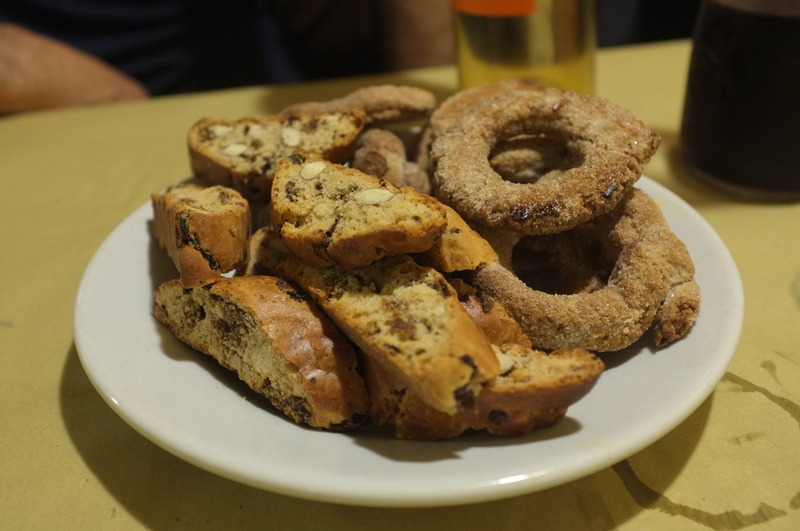 After such a large meal, I couldn’t fit in dessert, so instead we ordered a bottle of dessert wine and some biscotti for dipping (yes, I found this strange too – I love a biscuit dunked into my tea, but in wine?) The biscuit plate had both almond and chocolate cantucci (the biscotti that we are accustomed to in the UK) and red wine ciambelline. I shovelled a few into my bag to take home! 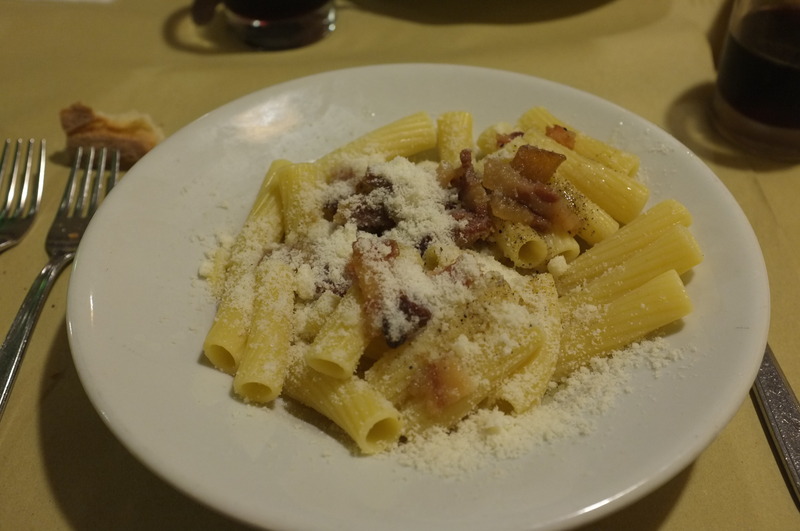 If you travel to Rome, you absolutely MUST visit La Sagra del Vino – until you have experienced authentic Roman dining, you haven’t truly experienced Roman culture. I want to have a reservation for (4) person on june 18, 2015 at 1pm. Hi Sasa, to make a reservation you can call the restaurant on +39 (0)6 3973 7015. I think one of the members of staff may speak english, but if not you will need to say: “vorrei prenotare un tavola per quattro, per il diciotto guigno, alle tredici.” Hope that helps!